The medical library called Biblioteca Lancisiana is located on the first floor of the Palazzo del Commendatore in The Monumental Complex of Santo Spirito in Saxia in Rome. Probably the most ancient public library in the world specifically dedicated to the study and work of physicians and medical students, it has been closed for more than a decade due to structural problems of the building. It is currently (April 2018) expected to reopen to the public in a couple of years. The library was "founded in 1711 by Giovanni Maria Lancisi, an eminent scholar and the doctor of Pope Innocent XI, who made this library the heart of his project for the promotion of scientific culture. 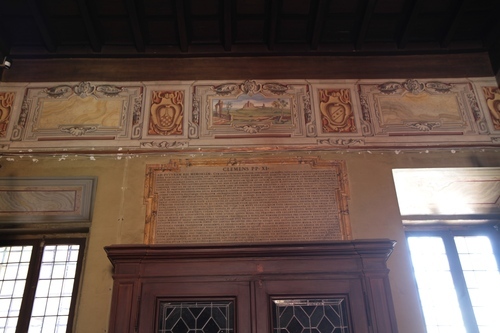 The library was inaugurated in 1714 in the presence of Pope Clement XI. It is composed of two large halls: the first one has an atrium and a vestibule; the second one, the former part of the library, has 16 wooden shelves. The collections of books comprise the Lancisi collection, made with books donated by the King of France Louis XIV, the Grand Duke of Tuscany Cosimo III and Prince Fürstenberg. The library also conserves 373 valued manuscripts from 14th to 20th century, among which two parchment codices with Latin translations of texts by Avicenna and the well-known Liber Fraternitatis Sancti Spiritus. A little window, located behind one of the walls of the library, opens up at the level of the frescoes of the Corsia Sistina: it allowed the various Commendatori who managed the Institute to hold in check the staff responsible for the ill assistance. In the middle of the main hall of the library there are two magnificent globes made in 1600"1. 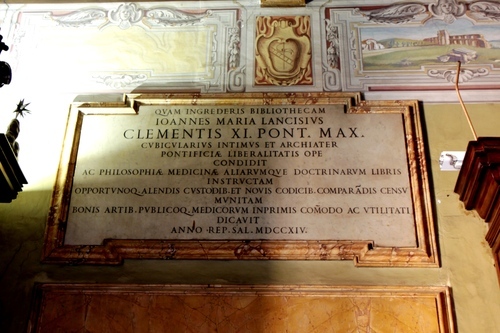 Over the interior side of the entrance door to the vestibule of the library there is a marble tablet with the text of the Papal bull in which Pope Clement XI praises the foundation of the library and inflicts serious spiritual penalties for those who will steal or damage the books. 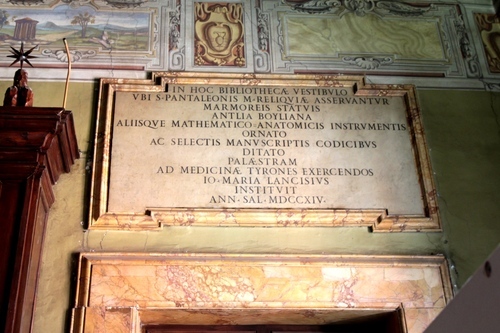 Over the door which connects the library's vestibule with the Room of the Commendatore a marble inscription remembers the main scientific instruments, works of art and books bequeathed by Lancisiand along with the relics of Saint Pantaleon originally preserved in this place. Photos by Luca Borghi ti.supmacinu|ihgrob.l#| (April 2018), courtesy of Dr. Patrizia Ricca, head librarian. 1. From Wikipedia contributors. (2018, April 2). Ospedale di Santo Spirito in Sassia. In Wikipedia, The Free Encyclopedia. Retrieved 13:24, April 30, 2018.